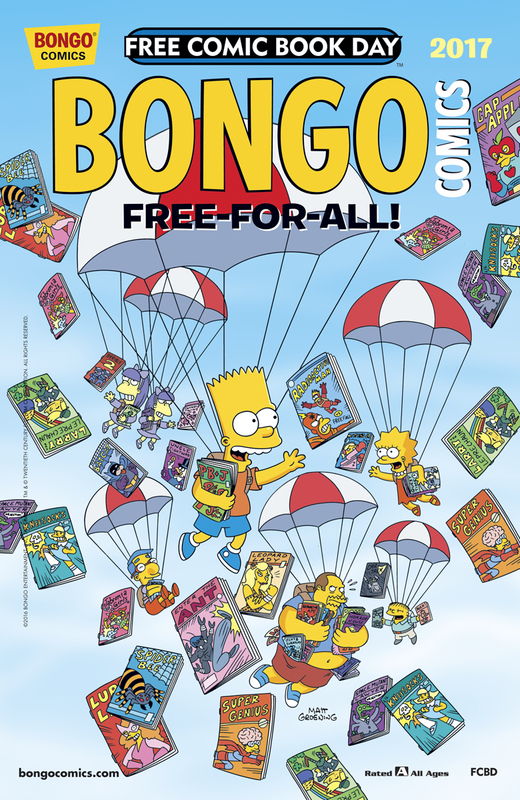 Bongo Comics Free-For All 2017 is a comic book that is free on May 6, 2017, which is Free Comic Book Day. "Get in line for the foremost Free Comic Book Day four-color giveaway of the year! When Bart injures his back and has to use a rolling backpack, he turns weakness into strength as the "Leader of the Backpack Pack." Then, Homer and Bart pull an all-nighter and put themselves on high alert to prevent a potential home invasion. Rod and Todd Flanders get separated from Ned Flanders in downtown Springfield and find themselves on an odyssey fraught with many mostly imagined dangers. All that and much, much more, and it's all free!" Modified on May 3, 2018, at 09:17.